6-8 fresh basil leaves, chopped. Prepare the tomatoes first. Parboil the tomatoes for one minute in boiling water that has just been removed from the burner. Drain. Using a sharp small knife, remove the skins of the tomatoes. (If the tomatoes are too hot, you can protect your finger tips by rubbing them with an ice cube between tomatoes.) Once the tomatoes are peeled, cut them in halves or quarters and remove the seeds and juice from their centers. Also cut out and discard the stem area. Why use plum tomatoes instead of regular tomatoes? The skins are much thicker and there are fewer seeds and less juice. Make sure there is a top rack in place in your oven. Turn on the oven to 450°F to preheat. While the oven is heating, chop up the tomatoes finely. Put tomatoes, garlic, 1 Tbsp extra virgin olive oil, vinegar in a bowl and mix. Add the chopped basil. Add salt and pepper to taste. Slice the baguette on a diagonal about ½ inch thick slices. Coat one side of each slice with olive oil using a pastry brush. Place on a cooking sheet, olive oil side down. You will want to toast them in the top rack in your oven, so you may need to do these in batches depending on the size of your oven. Once the oven has reached 450°F, place a tray of bread slices in the oven on the top rack. Toast for 5-6 minutes, until the bread just begins to turn golden brown. Alternatively, you can toast the bread without coating it in olive oil first. Toast on a griddle for 1 minute on each side. Take a sharp knife and score each slice 3 times. Rub some garlic in the slices and drizzle half a teaspoon of olive oil on each slice. This is the more traditional method of making bruschetta. Align the bread on a serving platter, olive oil side up. Either place the tomato topping in a bowl separately with a spoon for people to serve themselves over the bread, or place some topping on each slice of bread and serve. 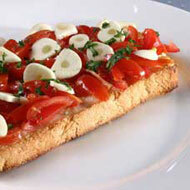 If you top each slice with the tomatoes, do it right before serving or the bread may get soggy.